The Virginia's View Challenge #16 theme is "100 % stamped". As I was playing around when I created something for the A Blog Named Hero Challenge I ended up with two cards. I'm entering both challenges with both of cards. They both have rainbow colors and are mostly stamped. In the bottom of my drawer I found an old rainbow ink pad I haven't used for AGES. They were very popular for a while, but I think it was only for a short period! Nowadays the ombré ink pads are very popular, so why not? It's almost the same thing so I decided to have a go. 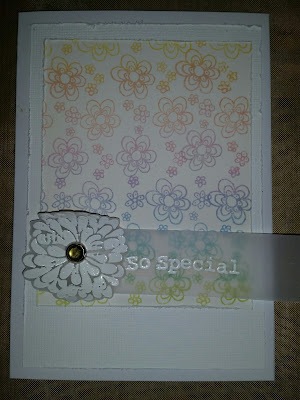 The background is made with one stamp that I stamped repeatedly by inking the stamp on different places on the inkpad to get a rainbow effect. 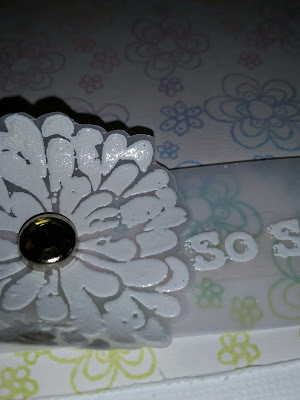 I distressed the edges of the papers so the card wouldn't look too flat. The single flower and the sentiment are stamped and embossed in white on parchment paper and attached to the card with a brad. Thank you so much, Bhavana! Create A Smile turns 1!